Often overlooked, the natural resources and entertainment amenities of an area can make or break a local or state economy. The clear goals of economic development are to bring in industry, grow it and expand it, attracting other industries as a result – with the occasional short discussion about the recreational amenities. It is often an after-thought while business leaders ponder such things as tax breaks and workforce training. But that ho-hum attitude about outdoors and recreation in a city or an area is changing in a big way for economic developers, borne out by statistics that prove their value. According to a 2012 report by the Boulder, Colorado-based, Outdoor Industry Association, on ten outdoor activities – bicycling, camping, fishing, hunting, motorcycling, off-roading, snow sports, trail sports, water sports and wildlife viewing – outdoor recreation accounts for 6.1 million jobs in this country. To put that in perspective, that is more jobs than education, more jobs than transportation and warehousing, and more jobs than construction. Americans spend as much on snow sports ($53 billion) each year as they do on internet access. They spend more on bicycling gear and trips ($81 billion) than they do on airplane tickets and fees. More than 140 million Americans will spend $646 billion in outdoor recreation – more than they spend on pharmaceuticals, more than they spend on motor vehicles and parts, and more than they spend on household utilities – that includes more than $120 billion in outdoor products such as footwear, apparel, equipment and services. Annual federal tax revenue from outdoor recreation is $39.9 billion, and state and local tax revenue is about the same. Outdoor recreation is a major economic driver that needs to be nurtured, the report states. It’s resilient and increasingly important to the economic health of a city or a region. One example that demonstrates the veracity of the report’s “must have” finding is the impact of outdoor and recreation amenities in the city of Grand Junction, Colorado, located at the junction of the Colorado River and the Gunnison River on Colorado’s western slope. The whole state is an economic powerhouse of outdoor activities that help support industry or becomes the solid growth industry in its own right. Colorado has miles of trails, national parks, family attractions and conserved landscapes across nearly 67 million acres. The state has 30 million acres of public lands, or approximately 45 percent of the total state land area, providing many recreation opportunities. Look at Grand Junction. 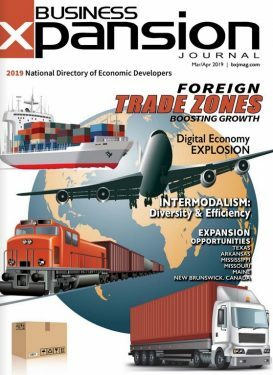 According to Tim Fry, vice chair of the Grand Junction Economic Partnership Board of Directors, the area has been focused on the production of oil and gas for years. But that industry experiences unpredictable ups and downs, and the community really suffers, he says. 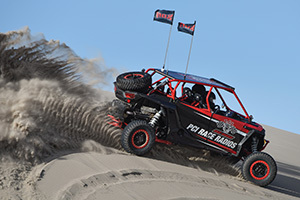 ATVs playing in the sand dunes. Courtesy of PCI Race Radios. There are a number of recreational activities at the Grand Mesa National Forest, including skiing and camping. 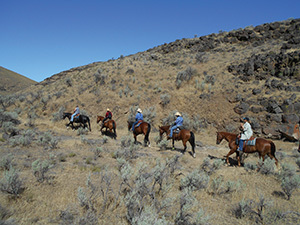 Visitors may also enjoy horseback riding or backpacking depending on their preference. There is boating on any one of the 300 lakes in the park, along with fishing for a number of different trout species, including golden lake, rainbow and cutthroat trout. Snowmobiling and mountain biking are also popular pursuits. The 60-mile roundtrip Colorado Riverfront Trail System along the river in Grand Junction has five distinct sections, including the blue heron and Audubon section, the monument view section, the parks and wildlife sections, the palisade section, and the riverside Las Colonias section. This diverse environment is home to more than 200 different species of birds, three endangered species of fish and other small animals. Grand Junction also has music festivals at local wineries throughout the spring and summer months. The area is considered Colorado’s wine country, with 20 wineries now flourishing there. Enjoying horseback adventures in the desert. Courtesy of Snake River EDA. In neighboring Idaho, along the Snake River, there are more white water opportunities than any other state in the lower 48, according to Kit Kamo, executive director of the Snake River Economic Development Alliance (SREDA). The SREDA, with offices in Ontario, Oregon, includes two counties on the western border of Idaho, plus Malheur County in Oregon. White water is best experienced in the Hells Canyon area of Snake River, near Lewiston. The river also features jet boat tours, fishing, hiking and camping. One example of a top fishing destination in the Snake River area is Brownlee Reservoir in Washington County, one of the state’s most productive fishing destinations bringing in more than $11 million in direct spending each year. The outdoor recreation industry already generates about $154 million in annual state tax revenue for Idaho while producing about $2.2 billion a year in retail sales and services. In addition, about 37,000 Idahoans are employed in the recreation technology (rec-tech) sector, with about 70 percent of rec-tech companies in Idaho’s smaller cities. Hunting and fishing is a $1 billion business in the state, supporting more than 15,000 jobs, according to the Congressional Sportsmen’s Foundation. Taney County, home of the Ozarks town and global entertainment destination center, Branson, Missouri, has developed some of the best recreational opportunities in the Midwest. Both entertainment and recreation attractions are booming. The area is currently experiencing more than $300 million in development and redevelopment. The city recently completed a $1.7 million IMAX Entertainment renovation; added the iconic 150 Navy Pier Ferris Wheel, originally located along Lake Michigan in downtown Chicago; renovated the downtown district with brick-paved sidewalks and new retro street lighting; and opened a new indoor sports enthusiast attraction, Fritz’s Adventure, featuring zip lining, urban wall climbing, underground tunnels and a ropes course. In addition, Dolly Parton’s Dixie Stampede, one of the city’s favorite attractions featuring a dinner show of horses and trick riding, completed its biggest show enhancement renovation since it opened in 1995, adding a new LED backdrop display along with new staging. To make access easier to this southwest Missouri town, this summer, new nationwide air service was added at the Branson Airport by Elite Airways, now offering daily non-stop service from Branson to Denver and Houston.